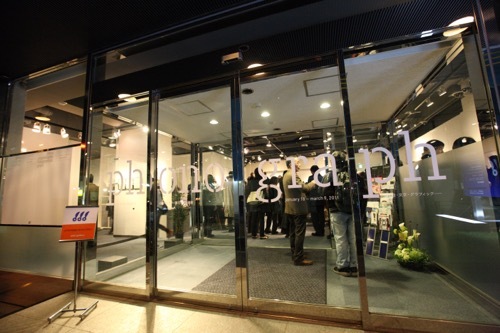 At this exhibition under the title “phono/graph,” I showed my works along with four other artists; previously, however, I held a one-man show at CCGA in 2001 titled “Reading to Another Dimension.” On that occasion, based on the concept of multi-media I attempted to express the act of reading not just as a visual experience but from multiple angles. Ten years later, the trend in evidence since last year or so suggests that paper may be heading toward oblivion. Against that backdrop, I began to wonder whether it might not be possible to think about books once again — and this is what led me to plan this latest exhibition. 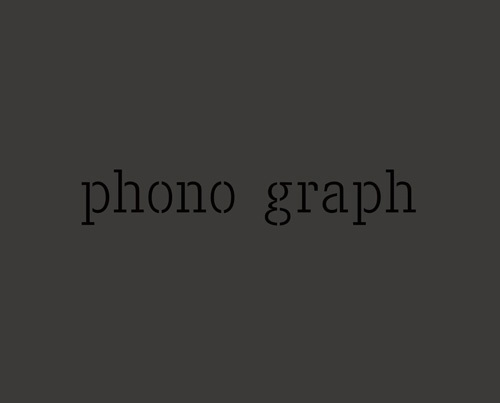 Three occurrences occasioned my choosing “phono/graph,” a concept having to do with sound, as my theme. First, in 1970 I read in the newspaper that Taruho Inagaki, a novelist, was to give an interview on the radio, and in happy surprise I decided to record it using a tape recorder. 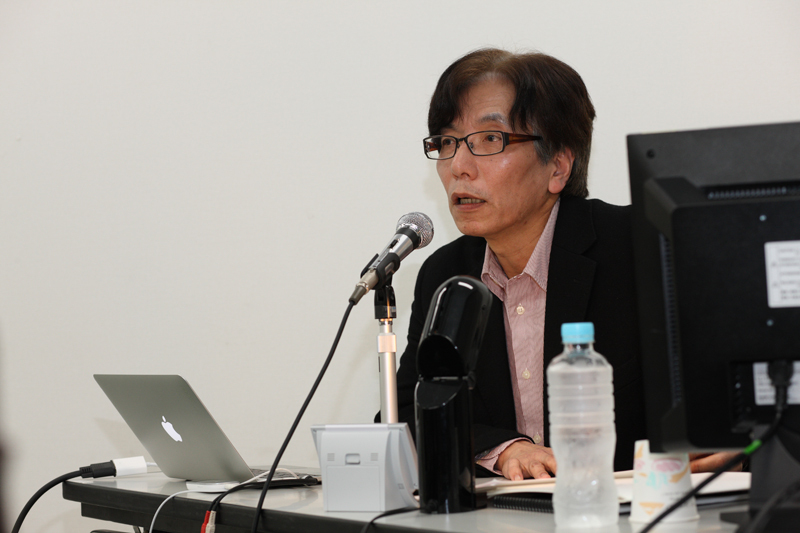 I was totally enthralled by Inagaki’s works at the time and the image I held of him was of a sensitive writer; yet what I heard coming from the radio live was someone speaking in a gruff voice in Kansai dialect at great speed. On the written page later published, what he said came across quite placidly. That was the first time in my life that I experienced so powerfully that transforming sound to letters — the process of graph — is beyond the realm of possibility. The second time was when I heard a CD of Marcel Duchamp reading the written text of a lecture he had given on the subject of art. As I listened I felt there was something unique about the rhythm of Duchamp’s speech. “This is music!” I thought. I happened to have a keyboard handy at the time, and I used the rhythm box to create a harmonic accompaniment. I immediately discovered that Duchamp was “singing along” in perfect step. When you listen to him this way, what he says no longer seems so abstruse — that’s how strong the power of the voice is, I now realize. The third occasion also had to do with Duchamp: a work of his titled “With Hidden Noise,” which he referred to as a “semi-readymade,” something created from an existing object but with touches added. “With Hidden Noise” consists of a ball of twine pressed between two brass plates joined by four long screws. The ball of twine contains something — its actual identity unknown even to Duchamp himself — that produces a rattling noise when the work is shaken. I think the work would be meaningless if it didn’t produce any noise. When you hear the noise, you realize it actually exists. It’s an expression of Duchamp’s attempt to record something that is invisible to the eye. Duchamp was critical of paintings that record images that are reflected by the retina; he said paintings were meant to be created by human intellect. In the realm of design, though, the visual is accorded absolute importance and no thought is given to our sense of hearing. In my opinion, however, we actually take in and manipulate more information with our ears than with our eyes. This is what the philosopher Ludwig Wittgenstein was referring to when he wrote how difficult it is to see what is before one’s very eyes. To see something objectively, one must put a distance between him and what he wishes to see. By contrast, it is impossible, as physicist and author Torahiko Terada said, to close one’s ears; one must always take in what they hear. Unlike the eyes, the ears hear all the sound around us — 360 degrees, forward, behind, left and right. This is an enormous difference. Marshall McLuhan said that the 20th century would become an era of electronic media, the result of which would be total changes on the fabric of society, its thinking and its ways of expression. The gist of what he suggested is that we should recover our aural capabilities. He states that originally it was the human sense of hearing that formed the core of the information zone within our lives; then society shifted to reading with the eyes, by the invention of printing process and development of movable type by Gutenberg. Also, with the emergence of perspective in the realm of painting, the visual came to take center stage as the source of information — a trend against which McLuhan rebelled. “Phonograph” is the name given by Edison to his gramophone machine. It is by no means limited to an expression of the visual alone. The desire to leave a record in some form in a different medium perhaps derives from our human curiosity. In the case of graphics, until now the process of recording something visually on paper was of key importance; but today I believe we ourselves must recognize anew that paper alone will not continue to function as the sole medium for doing so. It came to my mind immediately, and without wavering, just whom I should ask to participate in the exhibition. 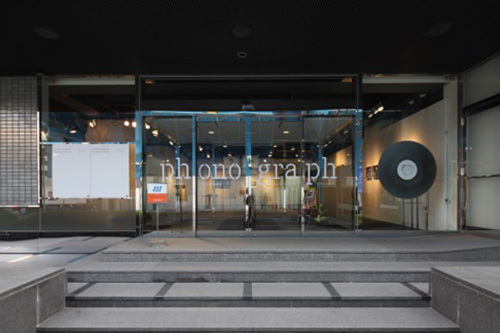 And rather than describing any specific direction for their works, I merely presented them with the title “phono/graph” and waited to see what kind of works they would come up with. Meanwhile I had everyone look at the five-part book series by Nicole Schmid, one of the participants, and proposed that perhaps the exhibition could be configured around it. The book is a compendium, without equal anywhere, of her research in the realm of letters and sound. Ms. Schmid is the daughter of Helmut Schmid, the renowned typographer who also undertook extremely interesting experiments relating to letters and sound. I had the other participants think and express themselves freely within the relationships among letters, sound and graphics, which became the overall concept. What I learned from this exhibition is that paper is amazing — and not about to vanish after all. The exhibition produced things in a variety of forms. This is something I believe everyone who came to see the show felt also.